Because of the ever-growing importance of computers beyond school, it is vital that students have a great amount of experience with them and the numerous services and tools they have to offer. One of these major services is Google Apps, which is Google’s productivity services – email, calendar, document creation and editing, and video sharing, to name a few – packaged for businesses, as well as for educational institutions. All of these services are Internet-based and require nothing more than an Internet connection and modern web browser to access, allowing students, teachers, and administration to get things done, no matter where they are in the world. Google Apps is an excellent tool for a school district, as it provides great tools for both the classroom and the management end of schools and the district. For example, Google Docs allows students to work on assignments online from any computer, meaning that jump drives and district student drives become pointless because it opens up the possibility of working on a project across several computers, somewhat like an online flash drive, as well as creation and editing of documents, spreadsheets, and presentations within the comfort of a web browser. Another benefit for students is that they do not have to worry about losing assignments because of corrupted files or forgetting to save. Everything on Google Docs is stored on Google’s secured servers and automatically saved. Collaboration is another one of the key elements of Google Docs, as it allows students to work on assignments together over the Internet, getting group assignments done quickly. Once assignments are complete, students can easily turn in assignments by simply sharing it with their teacher through Docs. Not only is Google Docs convenient for the students, though, but it is also great for staff use. Data sheets can be shared between staff, and when something must be fixed, the original document can be edited live and anyone that views it will see all the latest edits, without having to send out a new revision or worry about people looking at the wrong version of the document. On top of Docs, Google Apps offers a video sharing utility that gives teachers the ability to upload videos of their lessons for students who miss the class, or administration to distribute recordings of presentations to the other staff that may have missed the meeting. 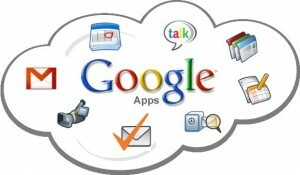 Google Apps also offers Gmail to its users, eliminating the need for the expensive and unstable Microsoft Exchange system and replacing it with a more user-friendly, online interface, and to make life a little easier for the IT guys, Apps has migration tools to help move everything over. These are just a few services that are available. Apps also offers calendars, sites, which could be useful for teachers who like to post assignments in easy-to-access places, and the “Apps Marketplace”, which makes Google Apps infinitely extensible, providing just about any service that could be desired. Google Apps for Education is easy to adopt, and reliable. Rather than having to make sure everything works right on every computer in the entire district, the Google Apps services are run by Google, require no more than an Internet connection and web browser, and have almost zero downtime, ever. On top of this, for educational institutions, the services are free. There is absolutely no cost to use Google Apps for education, and the number of accounts that can be created is “practically limitless.” On top of the zero-dollar price tag, Google Apps will save paper, allowing work that can easily eat up a whole tree worth of paper to be done on the computer, from anywhere. This will cut the amount of paper parents have to buy for their students, as well as also reduce the paper used in printing up announcements and other documents that could just as easily be sent out digitally. And, of course, the reduction in paper usage is both good for the wallet and a great start towards meeting the demand for environmental friendliness. Switching to Google Apps will also help build the district’s image. If the entire Marana district can adopt it, it will be only the second district in the entire state to fully switch, placing its schools among the thirty or so other schools that have switched. These include universities like ASU and U of A and high schools such as Yuma and Sunnyside High School. This recognition and use of technologies that many schools have yet to take advantage of would help promote our area, as well as possibly even prevent some students from transferring to other districts that haven’t adopted this excellent tool just yet. Overall, the switch to Google Apps will make many activities that are regularly required for teaching students, learning material, and administrating schools much easier, more efficient, and more collaborative, making the entire district more productive and more in touch with some of the excellent tools modern technology has to offer.